Wifiphisher is a security tool that mounts fast automated phishing attacks against WiFi networks in order to obtain secret passphrases and other credentials. It is a social engineering attack that unlike other methods it does not include any brute forcing. It is an easy way for obtaining credentials from captive portals and third party login pages or WPA/WPA2 secret passphrases. Victim is being deauthenticated from her access point. Wifiphisher continuously jams all of the target access point's wifi devices within range by sending deauth packets to the client from the access point, to the access point from the client, and to the broadcast address as well. Victim joins a rogue access point. Wifiphisher sniffs the area and copies the target access point's settings. It then creates a rogue wireless access point that is modeled on the target. It also sets up a NAT/DHCP server and forwards the right ports. Consequently, because of the jamming, clients will start connecting to the rogue access point. After this phase, the victim is MiTMed. Victim is being served a realistic router config-looking page. 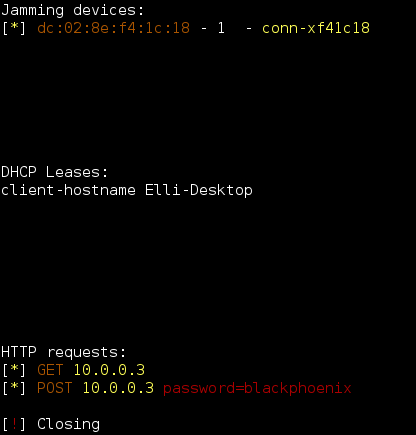 wifiphisher employs a minimal web server that responds to HTTP & HTTPS requests. As soon as the victim requests a page from the Internet, wifiphisher will respond with a realistic fake page that asks for credentials, for example one that asks WPA password confirmation due to a router firmware upgrade. -jI jamminginterface Choose the interface for jamming. By default script will find the most powerful interface and starts monitor mode on it. -aI apinterface Choose the interface for the fake AP. By default script will find the second most powerful interface and starts monitor mode on it. Two wireless network interfaces, one capable of injection.